Our family doesn’t watch a lot of television. Why? Because we are always on the go. Between Brownies, Girls Guides, taekwondo, swimming, work, and a new puppy, the amount of time we can devote to watching TV is slim. When we do get to watch TV, it is usually stuff we have PVR’d, or Netflix. So what do we like to watch? This is just like your typical teen suspense flick, with an awesome soundtrack, that includes and amazing cover of “Another Brick In The Wall” by “Class of ’99” (a supergroup featuring Layne Staley, Tom Morello, Stephen Perkins, Martin Le Nobl and Matt Serlectic), as well as a cover of David Bowie’s “Changes” by Shawn Mullins, and Alice Cooper’s “School’s Out” by Soul Asylum. The Offspring also performs “The Kids Aren’t Alright” like nobody else can. Starring: Josh Hartnett, Jordana Brewster, Salma Hayek, Robert Patrick, Jon Stewart, and Elijah Wood. Wendy is a big fan of Wolverine. Really, what gal isn’t? Starring: Hugh Jackman, Ian McKellen, Patrick Stewart, Halle Berry, Jennifer Lawrence, and Omar Sy. This remake of the classic 1976 flick starring Jodie Foster and Barbara Harris has been updated, but is basically the same funny story, which Rachel got a real kick out of! Starring: Jamie Lee Curtis, Lindsay Lohan, and Mark Harmon. Lauren has been watching this Disney Pixar blockbuster over and over. It is such an amazingly done movie, that our entire family loves! Starring: Amy Poehler, Phyllis Smith, Richard Kind, Bill Hader, Lewis Black, and Diane Lane. A 6-month Netflix Canada Subscription Giveaway! 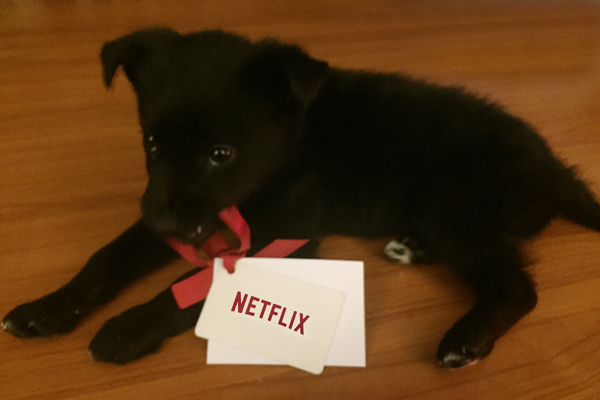 The folks at Netflix have generously given me a gift card for a 6-month subscription for Netflix Canada, for me to give away to one of my lucky readers! Our new puppy “Storm” wanted to keep it, but we were able to pry it from her grasp! Good luck, and happy streaming! Netflix is the world’s leading Internet television network with over 70 million members in over 190 countries enjoying more than 125 million hours of TV shows and movies per day, including original series, documentaries and feature films. Members can watch as much as they want, anytime, anywhere, on nearly any Internet-connected screen. Members can play, pause and resume watching, all without commercials or commitments. I honestly can’t get enough Netflix! The Netflix originals tend to be my favourites! I must be a kid at heart because I mostly look forward to watching Disney movies and don’t enjoy shows like Making A Murderer. Im looking forward to watching scandal! I’m looking forward to the next season of OITNB!! I’m looking forward to the upcoming season of house of cards! we are looking forward to Fuller House, we just re watched Full House.. I can’t wait to watch Inside Out! Black Mirror. Would love to watch those with the subscription. Thank you. I want to watch Friends. I am looking forward to watching some of the episodes of Heartland that I have missed. I like to watch Bones on Netflix ! I’m looking forward to watching Shameless and Orange is the new black. Looking forward to doing a rewatch of Grey’s Anatomy. Inside out with my daughter and fuller house! I am eager to see the next season of Jessica Jones. I’m looking forward to watching Fuller House. Making a Murderer, I would love to watch. I am looking forward to watching Inside Out. Would love to watch Suits and Bones! I love to watch the whole Grey’s Anatomy. Would love to try Netflix, but not sure where’d I’d find the time. Need to catch up with Orange is The New Black too. I am watching Suits it is a good show. I am looking forward to fuller house. House of Cards, can’t wait for the new season! The new season of House of Cards. I find the series About A Boy quite amusing. I would like to watch Home. I am looking forward to watching sense8 when t comes back on!! I’m looking forward to watching Making a Murderer. Everyone I know seems to have watched Making a Murderer and tells me I must watch it, so I suppose I will see what they are talking about. Would love to watch Scandal! I want to watch Bones tonight. I’d like to see Despicable Me. Would also like to watch Gilmore Girls. I would like to watch Tomorrowland. the luke cage series, when they release it. Fuller house would be fun! I’d like to watch CHuck. Would love to watch Gilmore Girls. I have been told that Scandal is one of the shows I should not miss, so I would like to watch it. fuller house and orange is the new black. I’d like to see Concussion. Orange is the new black I’ve heard great things about! I’d like to watch friends. Looking forward to watching White Collar Crime. I would like to watch Hope Floats on Netflix. I look forward to watching Fuller House. Gilmore girls would be fun! The new Gilmore girls season! Can’t wait !!! I’d like to watch Unbreakable. I really want to see Horns! Would be nice to watch Bones too. I want to watch so many things but The 100, the four new episodes of The Gilmore Girls (that used to be such a guilty pleasure) are the top two. I never did watch Dexter. I should try it out, retroactively. I look forward to Criminal Minds. I am enjoying the third season of The 100. Love this series! I’m looking forward to watching Better Call Saul. I would like to watch Winter’s Tale. I want to rematch the Walking Dead seasons to prepare for the new episodes! Derek is funny and touching. I really want to keep watching documentaries, before I had Netflix I had stopped watching them altogether. It’s good to stimulate your brain and learn something! Currently watching Hell on Wheels – Season 2! Maybe Scandal, heard good things about it. I would like to watch Fuller House and see how it compares to the original, which I found to be quite funny. Looking forward to watching z nation! So many shows and not enough time! I’m currently watching Switched at Birth and my girls are watching H2O. I read Orange is the New Black now I just have to watch it! Orange is the new black is something I have been meaning to watch! I have heard I should see Nashville so I would watch that series. I would like to continue watching Bones, I am only in the first season. I am always excited to watch animated movies with my kids, and Netflix has loads of them! I am looking forward to watching Narcos. I want to watch House Of Cards. I’ve already seen Orange is the new Black, but I can’t wait for new episodes! I would love to watch Fuller House and Making a Murderer. Would also like to check out Scandal. I would love to watch Glee, Glee and MORE GLEE!!! Were on a Thomas the tank engine kick around here, so I will have to watch it about 5000 times. Wentworth might be worth checking out too. I like watching with my grandchildren so I’d enjoy Hotel Transylvania with them. My girls have been watching H2O but I’m looking forward to seeing Fuller House later this month. Looking forward to watching Heartland! I’m looking forward to watching Wentworth! I look forward to watching Downton Abbey. I have never seen the series but have heard good reviews. Looking forward to watching Breaking Bad over again! Daredevil was a good show I would like to rewatch! Season 4 of Switched at Birth! I need to catch up on OITNB! I look forward to catching up on the episodes of Nashville that I have missed. Orange is the new black for me! I’d like to watch Orange is the New Black. I would like to watch the series Switched at Birth. I am looking forward to watching Valentine’s Day on Netflix. All of the xmen movies they have, maybe I’ll do a marathon! I was looking forward to watching Longest Ride on Netflix. I want to watch McFarland on Netflix. I look forward to watching Narcos. Fuller House- 5 more sleeps!! I would like to watch Still Alice. I want to see Still Alice! I want to watch Fuller House. I think my girls will love to watch the new series Project MC2. I would like to watch The Killing. I want to watch Life As We Know It. We can’t wait for another seasons of House of Cards! Inside out! Saw in threats and i want to watch it again! I would like to watch The Proposal on Netflix. I want to watch The Gilmore Girls. My kids are looking forward to watching Fuller House! I would like to watch Scandal. I want to watch all 100 seasons of Grey’s Anatomy! Thanks for the chance to win!